At this point, who knows what to believe? The whole iPad mini 2 Retina Display will-they-won't-they debate continues apace, with word that Samsung will provide a high-resolution screen for the tiny tablet. Sources speaking to the WSJ claim that Apple's sometime-nemesis will be supplying the display which will have Retina-level resolution like it's bigger counterpart, the iPad 4. Suppliers in Asia say that Apple had hoped just to use screens from Sharp and LG but has been forced to add Samsung into the mix to ensure it has enough displays to go around. 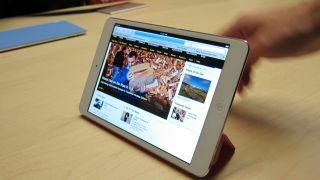 The sources also said that they are planning to enter mass production of the new iPad mini in the last quarter of the year - which jives nicely with predictions that Apple will announce its new tablet hardware in September or October. Just yesterday we reported on conflicting rumours, however, with iOS 7 code thought to relate to the iPad mini failing to offer the "@2x" mode hook that is necessary for Retina-level resolution. iOS 7 is still in beta, of course, so it could just be that this is something that's yet to come. Apple's under a lot more pressure to knock out an iPad mini 2 with a high resolution screen after Google's new Nexus 7 launched to much "highest resolution 7-inch tablet" fanfare from the Mountain View camp.